Mirpuri Foundation amplified the message of its Volvo Ocean Race “Turn the Tide on plastic” boat, by painting an Hi Fly Airbus A330 in the same livery. The aircraft will be operating worldwide. AkzoNobel also joined by providing coating to the project that will increase the United Nations Environment’s Clean Seas campaign with the newly branded aircraft. As the main sponsor of “Turn the Tide on Plastic” boat in the Volvo Ocean Race 2017-18 edition, the Mirpuri Foundation is raising awareness for this unprecedented campaign to eliminate marine litter and plastic in particular. If no action is taken, there will be more plastic than fish in the ocean by 2050. Hi Fly, an airline operating worldwide as wet leasing specialist, supported Mirpuri Foundation’s idea to carry the message across the five continents. 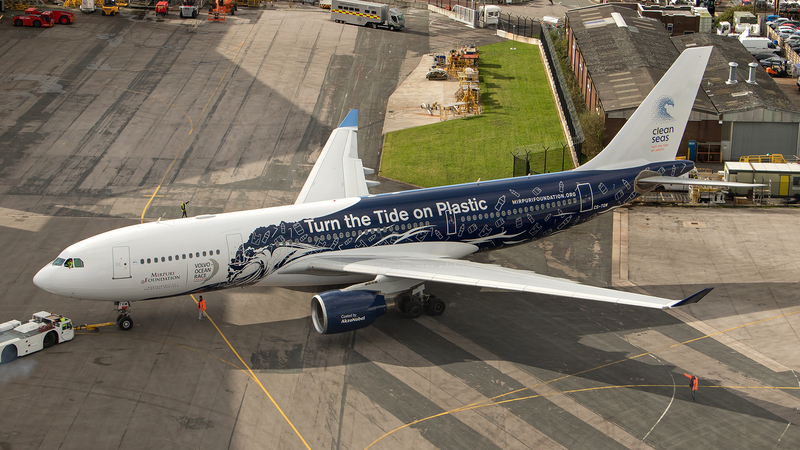 The chosen aircraft was an Airbus A330-200, which is now painted on both sides, matching the “Turn the Tide on Plastic” boat – one dark blue “polluted” side and another light blue “clean” one. “Only by acting together we will achieve our ultimate goal to make the world a better place for future generations”, said Paulo Mirpuri, President of both Hi Fly and Mirpuri Foundation. “I am incredibly proud to count on two amazing teams to do their best spreading our message not only in the sea but also across the skies”, he added. As the most important sporting event around the world and committed to ocean health, Volvo Ocean Race is backing this initiative. AkzoNobel, a leading global paint and coating company and one of the race’s main partners, also decided to join forces with Mirpuri Foundation and Hi Fly, coloring the aircraft. AkzoNobel is a sustainability partner of Volvo Ocean Race and a key contributor to the world-wide sustainability program during the race. AkzoNobel is also the company behind team AkzoNobel, one of the teams competing in the Volvo Ocean Race. Mirpuri Foundation is the principal sustainability partner of Volvo Ocean Race 2017-18 edition, and proudly sponsors the “Turn the Tide on Plastic” boat in the Volvo Ocean Race 2017-18 and besides the sustainability message that it carries, believes that the youth 50/50 male-female team will amplify United Nations Environment’s “Clean Seas” campaign around the world. Based on its commitment to make the world a better place for future generations, Mirpuri Foundation partners with governments, businesses, communities and individuals to address a range of projects in Aerospace, Medical Research, Wildlife Conservation, Performing Arts, Social Responsibility and Marine Conservation. Marine Conservation has been granted special attention and Mirpuri Foundation works to raise awareness of current challenges and emerging issues threatening our oceans such as pollution, acidification, rising temperatures, coral bleaching, unsustainable fishing methods and extinction risk in marine species. Hi Fly is an airline specialized in wet lease, EU – OPS carrier, FAA approved, EASA and IOSA certified. Hi Fly operates a large fleet of Airbus A330´s and A340´s, exclusively available for wet lease worldwide. Wet leasing (supply of aircraft with crew, maintenance and insurance) is Hi Fly core business, therefore unmatched operational expertise in this very specific field has been developed over a decade of experience. AkzoNobel is a leading global paints and performance coatings company and major producer of specialty chemicals, supplying essential ingredients, essential protection and essential color to industries and consumers worldwide. Backed by a pioneering heritage, their innovative products and sustainable technologies are designed to meet the growing demands of our fast-changing planet, while making life easier. Consistently ranked as a leader in sustainability, AkzoNobel is dedicated to energizing cities and communities.